Way the hell too much going on in my head tonight to share. I remember when I would ask people to pray for me or feel good when someone said they were praying for me. I really don't think I could care less now. When you let go of one thing, will there always be another to take its place. I finished my essay and maybe I'll post it on this site for those of you that are interested. Until then, please enjoy the 22 part of my 30 part series entitled "Japan Sees, Japan Does". 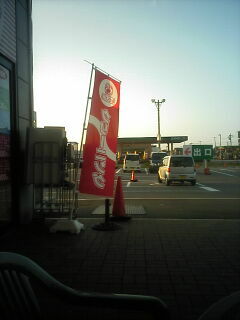 Here, a flag advertising cleaning.